When it is 2000, the first computer you have in your house is a 133MHz Pentium with 16MB of RAM with no network connectivity and you enjoy videogames as a hobby, you don’t have a lot to choose from in terms of what your hardware is capable of allowing you to play. With an internet connection, the story may have been different: the likes of Abandonia were already established, and had a good twenty years’ worth of games that could be run in some way or another on such already-antiquated hardware. Given that this wasn’t an option beyond going to the public library with a pocket full of 1.44MB 3.5″ floppy disks (as well as mastering the art of splitting archives across multiple disks and hoping beyond all hope that none would develop a bad sector in transit), solace was found in the number of Packard Bell disks that I had salvaged from the family member who kindly donated to computer to us. The important thing to note about the vintage of the computer that this was is that computer hardware was still moving forward at a rate fast enough, and at prices high enough, for each new purchase of a computer to be considered a generational, rather than minor iterative, leap, with hardware vendors trading very heavily on this and throwing in software with their hardware to best show off what the latest technology could muster. 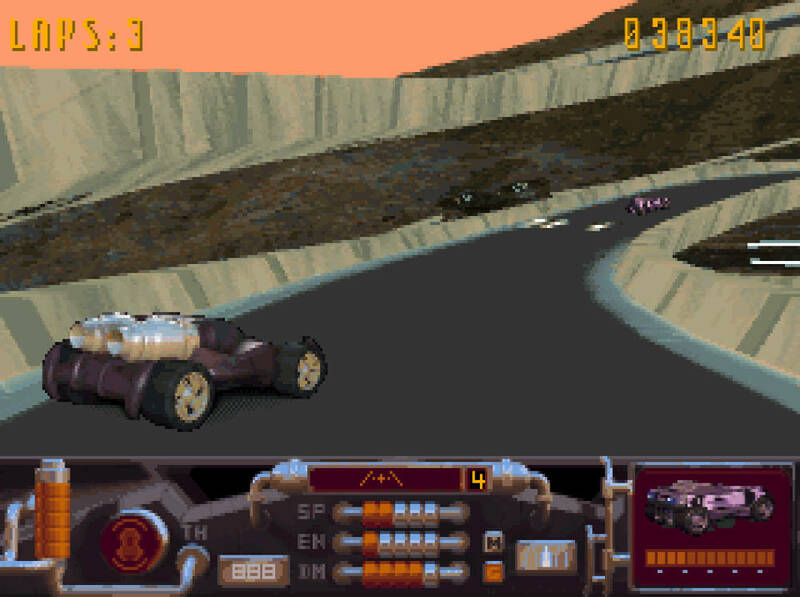 In the case of my computer, Megarace was the game that could show off the vast wonders of modern computing. Facing this, even at the time, anachronistically – I’d already had a PlayStation for some years, and it was no slouch graphically for the time – it seemed odd to me that Megarace, with its pseduo-3D sprites and scrolling backgrounds, could ever have been considered the pinnacle of what home computing could provide. This was probably compounded by having played Resident Evil and Final Fantasy VIII ahead of playing Megarace: it’s clear, with the benefit of hindsight, that the cardinal virtue of the game was its many, many full-motion video (FMV) cutscenes held on the once-new wonder that was the compact disc. With a fairly small hard disc footprint (around 20MB or so, on an incredibly hazy recollection), the game made heavy use of the CD drive in order to bring you the story of a futuristic world in which “Enforcers” are employed to take down speed-racing gangs in a virtual-reality context, a flimsy plot derivative of so much late 1980s and earlier 1990s science fiction. 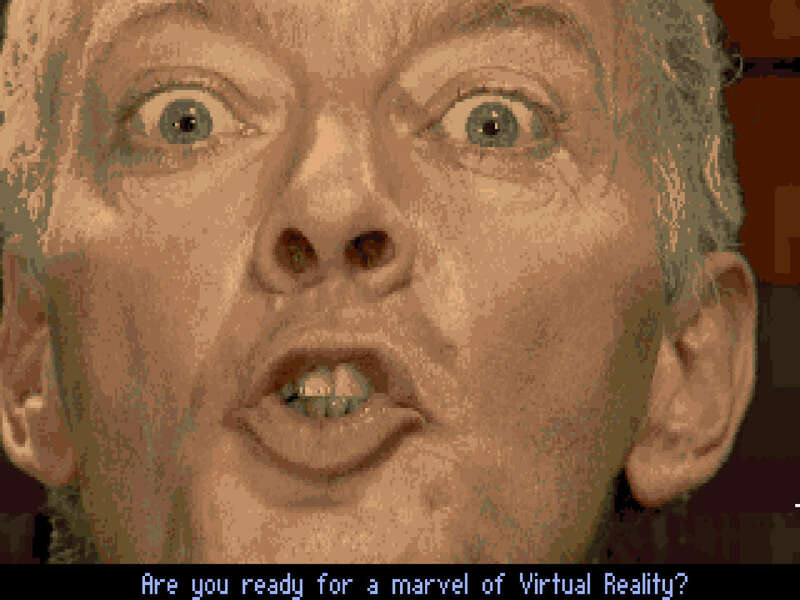 There’s liberal sprinklings of Robocop, The Running Man and even Tron here, and it is horrifically cheesy and derivative to the point of mindlessness, but this lunacy is demonstrative of much of the charm of early-90s PC gaming, where a myriad of smaller studios were free to develop and have published games of varying quality as what the video game market actually was was yet to be defined in as cast-iron terms as it is now. T his element of charm is no better shown than by the host of the show in which the Enforcer player character is participating: the curiously named Lance Boyle. Taking any and all opportunities to make jibes at the player’s actions, no matter how successful the player may be, an awarding prizes that border on “bobby prize” levels of quality in such a spiteful, vicious manner. It’s difficult to decide whether the acting on show is poor or brilliant to the point of exercising a clearly defined prior intent of parody. The pre-rendered backgrounds, while primitive, are perfectly functional and suit the aesthetic of the game well. The game plays as a somewhat nascent version of Wipeout, with a pack of racers being on a racetrack armed with weapons, each seeking to either destroy or outrun their competition. Similarly, there are a limited number of vehicles that can be used with three available from the beginning with more being unlocked as victories are achieved. Weapon usage is limited by the amount of energy that is available to the player – which can be picked up by running over certain parts of the track, varying dependent upon vehicle chosen – with vehicle hardiness and speed being dictated by the type of vehicle chosen prior to the race. Yes, the number of gameplay elements within the game is low, and yes, the formula has been executed in much better ways since the release of Megarace, but the simplicity of the gameplay is so unquanitifiably appealing: move forward; attack rivals; overtake; accelerate; win – as perfect a distillation of the idea of the weaponised racer as could be imagined. It’s flawed, it’s old, but it is available on GOG.com: as with many games of its vintage, it will require a certain attitude to be taken in regard to it for it to be enjoyed. Without saying anything trite about the necessity of the appreciation of gaming’s heritage, Megarace is a good example of the effects that new technology can have on games. While you could pick any game distributed on CD that makes use of FMV to demonstrate this point, the fairly traditional approach used by Megarace in its in-game graphics makes this more clear than the likes of Fear Effect.